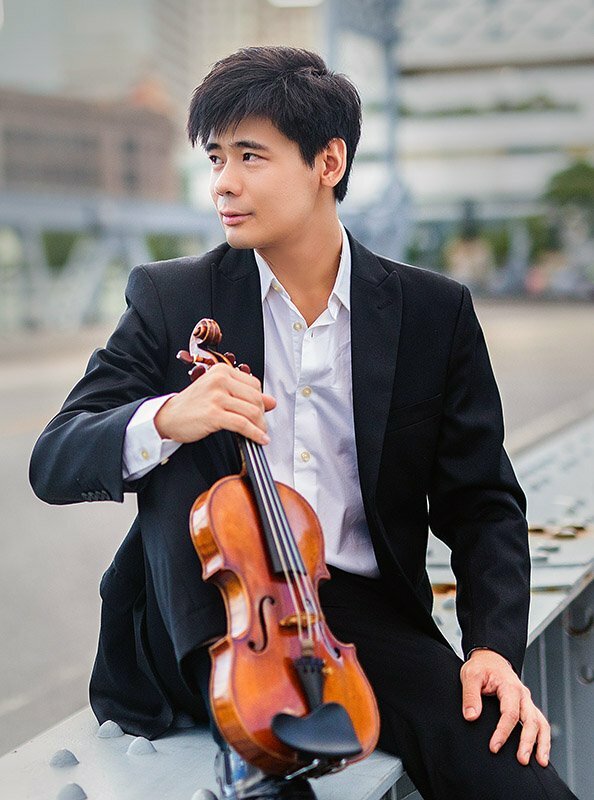 Together, the celebrated young virtuosi violinist Angelo Xiang Yu and confident pianist Peter Chuang Chuang Fang (who dispatched a brilliant Hammerklavier 12 days ago at this Foundation for Chinese Performing Arts Festival), brought passion and panache to the Keiter Center Saturday to a spectacular display of technique and musicality in four well-known offerings. Tomaso Antonio Vitali, the long-lived 17th– to 18th -century composer who putatively composed the G Minor Chaconne we heard, spent most of his life in Modena, home of balsamic vinegar. The duo endowed it an essentially Romantic flare and a soupçon of acetic élan. Its plentiful modulations, unusual for the baroque period, have led some to speculate that the work may have been modified by others or, actually, written later. Heifetz included the piece in his New York debut in May of 1920. Yu and Fang delivered a performance at least on a par with the competition. The Brahms Sonata for Violin and Piano No. 3 in D Minor differs from its siblings in the set of three by having four movements, though it is not any longer. From the lyrical opening fourth in the violin part, along with the descending line in the piano, through the reciprocal interchanges between the instruments in the second theme, to the quiet conclusion, the first movement pulls the listener into an immediately felt intense and personal conversation. The artists interpreted the two middle movements with the contrasts demanded. The adagio of the second movement with its D Major first theme was incandescent in its longing, and the second theme (A Major) reflected equal and evocative partnering. The third movement, un poco presto e con sentiment, led by the piano melody, fulfilled its title. The final presto agitato emerged with soul. Watching Yu jump and pounce like a panther added enjoyable emphasis. Following the intermission, the twosome gave Beethoven’s Sonata No. 9 in A Major, Opus 47 for Piano and Violin, the Kreuzer (or in English, Kreutzer), with intensity, flair, and the requisite introspection. 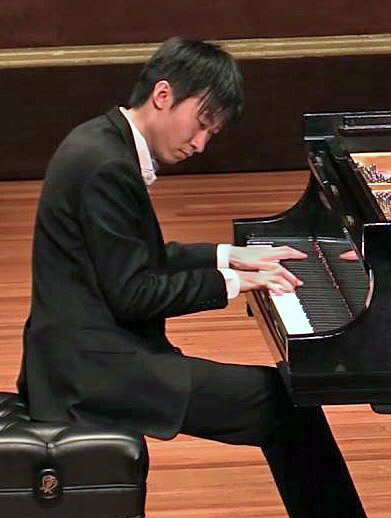 Yu projected the exposed chords of the difficult and iconoclastic opening with the firm and warm intent of the adagio sostenuto, and followed with the octaves of the presto, more martelé than spiccato—and then a luminescent version of rest of the unique first movement. The andante con variazioni brought a lively collaboration. But the third movement presto, while riveting, perhaps ran slightly too fast, even for a tarantella, as some call it. Pablo de Sarasate’s Carmen Concert Fantasy, Opus 25, provides an unabashed show for violinists, with the collaborating pianist taking the straight man role, as the violinist plays gypsy, toreodor and unlucky tenor. On Saturday night, Yu and Fang obviously relished it, with both tongues firmly in cheek. After curtain calls, the duo played the brief Melodie from Gluck’s Orfeo ed Euridice to general approbation. Both interpreters proved absorbing throughout, making close and direct connections with listeners and each other. Yu’s face mirrors his wrenching soul as he fairly dances. His gorgeous sound and dramatic intensity immediately show why he won the Yehudi Menuhin International Violin Competition (2010). Fang possesses certifiable gifts as well, being celebrated for his solo as well as collaborative concerts. I agree with BMInt’s David Moran, who last week found him, “at once probing and singing, at once tonally lovely and structurally lucid.” Go hear them! Pianist and long-time music lover Julie Ingelfinger enjoys day jobs as professor of pediatrics at Harvard Medical School, pediatric nephrologist at Mass General Hospital for Children and deputy editor at the New England Journal of Medicine. Julie Ingelfinger does it again, with a write up at once piercingly perceptive, evolved, and warmly appreciative of the virtuoso performances on both piano and violin. It’s nice to see a reviewer who can distinguish a spiccato from a pizzicato. I have just discovered her as a reviewer but she is a gem. I hope she continues to write for you. One question though-was that elan more acetic or acidic? Does the reader understand that vinegar is acetic acid? Many years ago, I heard Vitali’s Chaconne played by Mr. Yu on the public radio while I was driving. I ended up stopping my car and started crying. It was so pure, beautiful, enchanting, and breathtaking.